The DWL-2000AP is a basic wireless access point supporting 801.11g (54 Mbs) and is backwards compatible to 801.11b (11 Mbs). The box is simplicity itself to deploy, as it has just a power connecter (which connects to the supplied transformer), and RJ-45 ethernet connector, a reset button and an angle-able aerial. The unit is also supplied with a CD containing some Windows management software, but as we shall see, this is completely unnecessary. Inwardly the device contains a small web-server through which the device can be configured, backed up and have its firmware upgraded. The networking software supports unencrypted, 64-bit WEP, 128-bit WEP and 802.1x authentication. 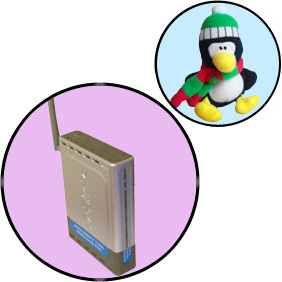 The device also has a simple SNMP interface for monitoring network usage, a MAC address filter for limiting those who can connect, and a simple DHCP server. Having plugged the box into your network and powered it up, connect to 192.168.0.50 in Internet Explorer using the supplied username and password, and you will be presented with a nicely laid out screen with the friendly words Run Wizard in the center. Clicking this button sets up most of what you need to get going. The more observant among you (or perhaps just the die hard Linux users) will have noticed that I said Internet Explorer back there. I have tried using both Mozilla and Konqueror, but these seem to have problems running the script code behind the Accept buttons, so you might be able to edit the fields, but you can't save your changes! Also note that if 192.168.0.0 is not your normal network address, then you will tempoarily need to change you machine's IP address to something on this network e.g. 192.168.0.49. My experience with the device is that the best security I could attain with the standard firmware (in my case Rev B 1.7) is 128-bit WEP with MAC filtering enabled. The latter has the nice feature of being able to take a connected client and add its MAC address to the list without you having to re-type it. If you are lucky enough to have a spare, always on, machine, then you could run a RADIUS server on it and use 802.1x authentication. The encryption keys can be specified in Hex or ASCII, and although Hex keys offer more combinations, ASCII keys are easier to remember if you are ever to have guest users connecting to you Access Point. In order to make the device function transparently, you will probably need to change it's IP address so that it appears on your normal subnet. If you have a DHCP server, then stick to using that, but if you don't then the device has a simple DHCP server that can dynamically allocated IP addresses for you. One that that you will need to set, if any of these machines is going to see beyond the local subnet is a default gateway. The IP address and gateway are configured under Home->LAN. I read with interest that WPA (Wi-Fi Protected Access) would be available in Spring 2003 as a free download. This is a stronger form of encryption which uses a cyclically generated key. Now if you look on the US website you will find several firmware updates, up to version 2.06 (16th March 2004). However, if like me, you live outside the US, there is a huge disclaimer that states you will invalidate your warranty (which is a respectable 3 years by the way) by installing one of the updates, as they are intended for US customers only. After some more digging, I found that the UK website only listed the DWL-2000AP+, which although it sounds the same, has different firmware. Further digging in the support section reveiled a combo which allows you to select "Wireless" (at the bottom) and this opens a window onto an area of their FTP site dedicated to wireless product updates, and lo and behold, we have a directory called dwl-2000ap_rev_bx, and inside we have a firmware update and PDFs of the manual and Quick Start Guide. Having done that, you need to download the file dwl2000ap_fw_v205b4.zip (dated 5th Feb 2004), extract the only file in it, dwl2000ap_firmware_205b4.bin and then, remembering where you extracted it to, go to Tools->Firmware and hit the Browse... button. Select the above .bin file from where you saved it and then hit Apply. After a few moments the update will have been made, and the device will revert to 192.168.0.50. Works well with standard firmware and 801.11b card. Signal strength seems rather low. Often drops to 5.5 Mbs, but rarely drops connection. Improved things slightly by setting Xmit power to max in driver configuration. New firmware took some connects to same card ok, but signal stength waxes and wanes as before and still drops to 5.5 Mbs. Connection does drop out occasionally. I finished up having to change channel in order to get a stronger signal. In order to make use of new WPA config option, you need a patch from Microsoft which adds WPA to the list of key options. You will however need 802.1x enabled in order to use this. The new wireless configruration seems to have an aversion to Shared Network keys, instead we have to stick to Open Connection (which doesn't sound particluarly secure!). This patch is not distributed through Windows Update, but you can download it from Microsoft as Update for Microsoft Windows XP: KB826942. I then found that the drivers I was using for my network card were not new enough to support WPA, hence my problems, so having applied XP Service Pack 2 (which includes the above patch) and updated my drivers, I was finally able to establish a WPA-PSK connection using TKIP (which is basically a time-shifted key with an initial passkey, which is much more secure than WEP). However I still get connection drops occasionally and moving both machine and access point has little effect. I have little experience of using this access point from Linux, mainly due to the drivers for my wireless card being under development. I have managed to sustain a connection, but this was only with WEP turned off. The newer drivers are supposed to support WPA, so there is hope yet. I will report my findings here.